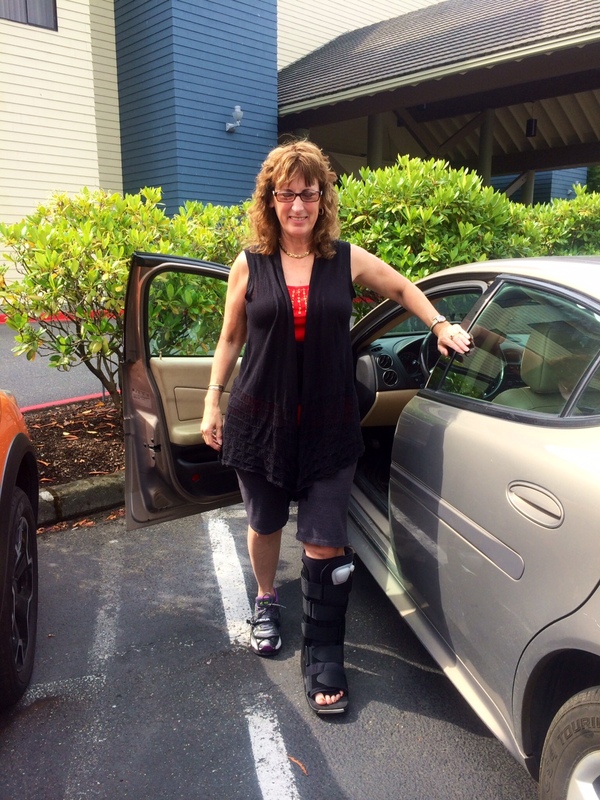 Aug. 14th, 2014 – A return to Dr. Gent’s office for my 5th week post Arthrex TightRope Dynamic Stabilization Surgery on my left ankle to stabilize the chronic high ankle sprain and syndesmosis disruption of of distal tibiofibular joint. 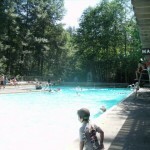 I have been non-weight bearing for the last 5 weeks with only the last few days doing some walking in a pool in preparation to walk on land with full weight. 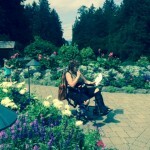 In my last blog I had shared that on 8-7-14 I sprained my left ankle falling off of the knee scooter. I was really concerned but the good news is Dr. Gent said: “Ultrasound of the the left ankle/foot were imaged with the interosseous ligament and the ATFL looking healthy and in good presentation. Bone structures are also in good presentation with the tightrope functioning well. 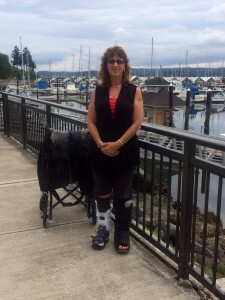 ” He also said I could now begin full weight bearing with the CAM walking boot and transitioning into normal shoe gear and increase my physical therapy activity. So out of his office I went to begin my vacation with my sister who I had not seen in 2 years. She came out to Idaho and we decided to vacation on the Olympic Peninsula and take the ferry from Port Angeles, WA to go over to Victoria, BC. 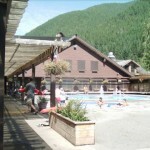 After leaving Victoria, BC we went to the Sol Duc Hot Springs in the Olympic Forest. I enjoyed a 2 hour massage while my sister hiked for 2 hours in the surrounding forest and then we both were in the mineral pools. Aug. 19th, 2014 -Back to Poulsbo, WA one of my favorite small towns this time standing and walking and not rolling around on a knee scooter. This was the 6th day on my foot and my sister and I walked a lot in and around the town. When I felt sore or tired, she would push me in the wheelchair and then after being refreshed, I walked some more. The EvenUp Shoe Balancer purchased at this website: www.castcoverz.com was strapped on my right tennis shoe which helped a lot to balance the height difference of a walking boot with my tennis shoe. I highly recommend anyone using a walking boot to consider this product to make their walking easier and more comfortable to their hips. This evening I made my first attempt to walk only with my tennis shoes. I was pleasingly surprised even though I had a swollen ankle. There was pain but not the same pain as before the surgery 6 weeks earlier. I find the scenery very calming and peaceful along this shoreline surrounding our hotel, the Best Western Plus Silverdale, Beach. Aug. 20th, 2014 – I went back to Dr. Gent’s office, Kitsap Foot and Ankle Clinic in Bremerton, WA. He was so surprised to see me walking only in my tennis shoes without any bracing. I told him I had enough of the walking boot as I so desperately wanted to feel a normal gait with a bend in my ankle. He thought I was doing very well. In comparison to most patients, I was in the top 20 percent of healing at 6 weeks out since surgery. Of course I had pain and pain makes me very emotional. My mind says I should be walking just fine even though I didn’t walk at all for 5 weeks. There is a healing progression and I do everything there is to speed it up; however, it simply just takes time. Patience is not my virtue even though my journey has forced me to learn more of it. 9-12 weeks is a more realistic time of healing than 6 weeks after this type of surgery because the ligaments/tendons need time to heal even though the bone is now secure. Also saying goodbye to Dr. Gent is never easy for me. His kind words of encouragement to do my physical therapy and his reassurance that I would walk better by the time he sees me again was all I needed to hear. I left his office with the vision to work hard at my exercises of stretching and strengthening the ankle/foot. Aug . 21st, 2014 – Back in Spokane saying goodbye to my sister at the airport. She had been such a blessing to help me these past 2 weeks hauling me and my luggage around. Now I was on my own. I returned the knee walker and wheelchair and I said no more. I’ve had enough these past 4 years of surgical rehabs, medical equipment and supplies. 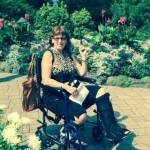 See my homepage for my entire medical journey thus far. As soon as I got back from my trip, I went to Dr. Sheldon, DC for a back check and for him to see me walking again. He did the below video of me walking and showing my ankle. 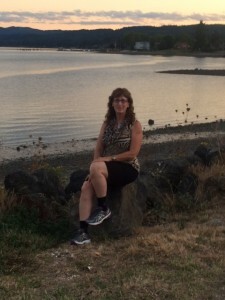 Aug. 22, 2014 – My first physical therapy appointment started out with my left ankle having 6 degrees of active dorsiflexion with an extended knee while my right ankle had 11 degrees. This may not seem to be a lot of difference but it is when it comes to having a correct walking gait. The goal was to improve this function. My Gastrocs/Soleus/Achilles muscles-tendons were tight and preventing the dorsiflexion. Heat, stretching and ROM exercise was the plan of the day. 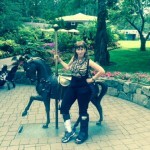 Aug. 25th, 2014 – My first day to be on my horse again since my July 6th victory ride as documented in this blog link for my prior surgery healing/recovery. 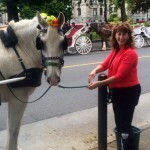 I started out with only a 15 minute ride after my horse trainer warmed my mare up. A little stiffness in the ankle but no increase of pain while holding foot at a bent angle in the stirrup. Aug. 27th-Sept. 9th, 2014 – I had 5 more physical therapy appointments, along with 3 massage appointments, 1 acupuncture appointment to help the healing process. I had been on my horse several times and then I decided to have a trail ride on 9/7 for 2 hours in the saddle. This was my first trail ride in a year since last labor day. So much has happened during this past year. 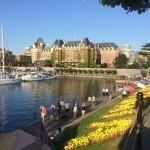 For those new to my blogs here is a link back to that time a year ago. I survived the 2 hours and I didn’t feel any increase of pain in my ankle. I was pleasingly surprised. The rest of me held up too. Our trail rides near my home are up and down hills, not a flat city metro park type trail. My horse gets a work out and so do I. Exercise on my horse gives me endorphins which make me happy and I could care less if I pay for it later. 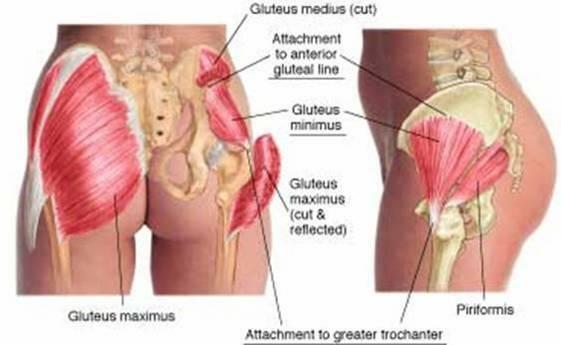 I ached the next day behind my hips where the gluteus muscles attached to the Greater Trochanter. ( See anatomy picture, click to enlarge) Oh well what can I say, I just needed to get out into the woods! On 9/9 I had the best walking connection thus far after my p/t appointment. However during these past weeks, I have been struggling with some pressure into my metatarsals of my left foot as my gait was not 100% nor should it be at this point of rehab. Walking is not just about the foot/ankle but about the entire movement of the hip/pelvis and muscles all the way to the feet. Rehab involves more than just isolated work on the ankle. Functional physical therapy includes everything. I can assure you that without glute strength, your foot will not strike the ground correctly. And if the foot does not have enough correct bending flexion, an overload will occur in the forefoot. I wish I could describe my thoughts better in medical terms but I cannot. So I’ve been playing around with different shoes and pads on OTC orthotics to see if I could ease any discomfort in my foot from compensating. 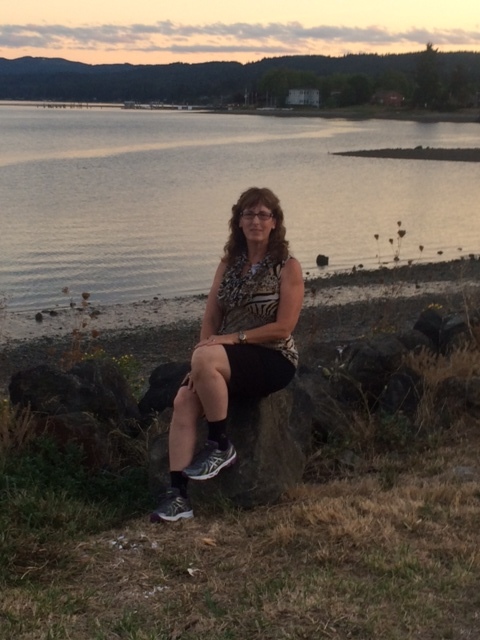 Sept. 10th, 2014 – Off to Seattle/Bremerton again for another follow up with Dr. Gent. By this evening, after sitting in a car traveling all day long, I was having a level 7 pain of my ankle/lower leg. My ankle was swollen and I had achy/spasm muscle pain up my calf. I had iced it several times, then some heat and gentle stretching. I hadn’t taken any medication for weeks, but this night was a Diazepam night for the anxiety of feeling the pain/spasm. I had been faithful to heat then stretch my Achilles tendon everyday but the pain was actually now worse. I feel like I reached a plateau of achievement and I couldn’t press beyond. Sept. 11th, 2014 – A busy day at Dr. Gent’s office. Most importantly, my neighbor lady was getting a pre-surgical evaluation on her foot problems, along with my husband getting an evaluation for some nerve pain in his heel, and for myself a follow up appointment. Dr. Gent said I was doing well even though I thought otherwise. He modified my OTC orthotics to be more comfortable under my midfoot and metatarsals. 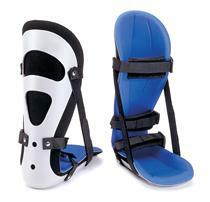 I don’t need any orthotic for arch control as the HyProCure Surgery fixed that problem. In fact, if I try and use arch support, I walk too much on my lateral side of my foot. It simply is not needed. I wear just a basic comfort insert that he modified with some padding under the middle of my foot to raise it and unload my forefoot. My peroneal and anterior tendons down my left ankle and foot have been negatively affected to some degree for 12 years since my foot drop, along with the prior talus bone instability and prior ankle sprain. I am sincerely very blessed to not have worse symptoms in my foot. All my surgeries have worked to improve my condition 100%. There are no regrets! I just need to give it more time. Dr. Gent gave me an Ossur Night Splint to keep my ankle at 90 degrees and to help work on stretching the Achilles some more. Exactly a year ago I was in a cast for my Talus fracture and non-weight bearing for 8 weeks. What am I complaining about as life is now good. Sorry, I just want the icing on the cake to rid myself of pre Achilles tendinitis and tight gastroc/soleus muscles. 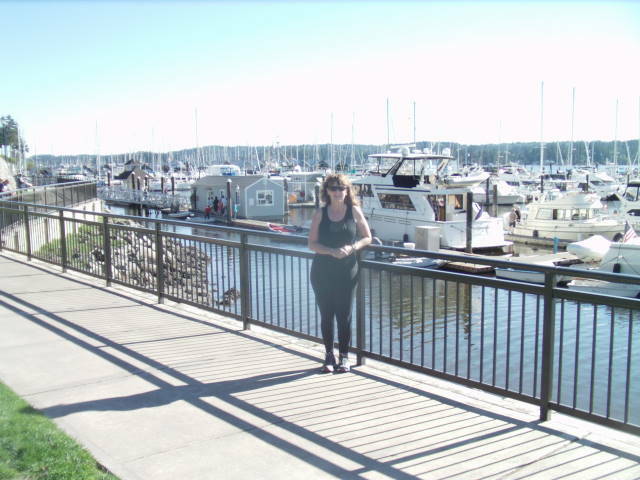 Sept. 12th, 2014 – While my husband attended 2 days of business educational training across the water, I went to my favorite place, the Pacific Surgery Center, Poulsbo, WA. My neighbor lady came to see Dr. Gent for him to do the HyProCure procedure to stabilize her laxity surrounding the subtalar joint on her foot along with fixing her painful toes. 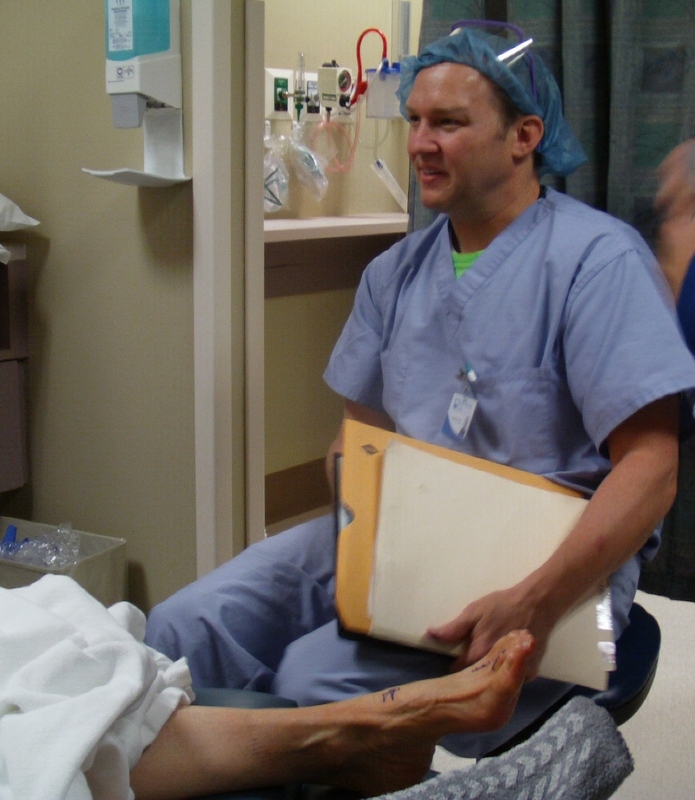 It’s her foot pictured here with Dr. Gent before surgery. All the nurses knew me from my 3 prior surgeries at this facility and they were so glad that I was now walking. They gave my friend excellent care; however, I must say it was a good but an odd feeling that I was sitting this one out. I was there for my friend every step of the way in planning her surgical trip to Dr. Gent. Her surgery went just fine and she was so pleased with the care he provided her too. She woke up from surgery, not groggy at all and acted a lot like myself in being the energizer bunny for the next 24 hours after surgery. It was interesting to watch as we shared a hotel suite. Hopefully, I’ll write her recovery story in the near future. When Dr. Gent was done with my friend’s surgery, he spent some time again re-modifying my orthotic which has now made a positive difference in what my foot feels when walking in my tennis shoes. He also listened to my concern over the severe muscle spasm I had during the night when wearing the night splint. I promised him that I would keep trying with it and using my rice heat packs. He wanted me to continue with physical therapy and work on the Achilles tendon issue. Sept. 13th , 2014 – My lady friend was stable and her husband and I took a break from the hotel to go to Poulsbo so I could buy some more of my favorite Cardamom sweet bread from the Sluys Scandinavian Bakery. 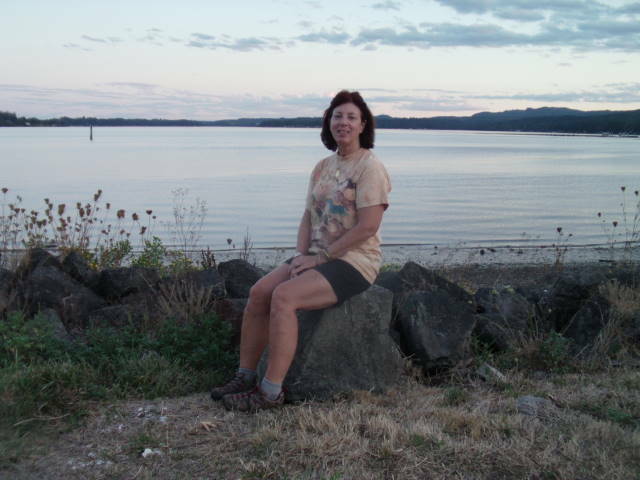 I am pictured here standing again by the water in Poulsbo, WA but this time around no more walking boots and braces on my ankles. It was a joy to walk this town unassisted! It has now been 9 weeks since my 7-11-14 surgery and only 4 full weeks of walking. 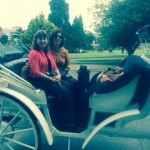 Sept 15th, 2014 – Back home in Idaho, I enjoyed a ride on my horse again and then a massage. Still struggling with the back of my calf being stiff with some spasm. I’m not sure how this is all going to work out. I am very flexible everywhere in my body except for this left leg calf/Achilles tendon. It is frustrating to say the least. 5 nights of using the night splint without any positive signs that its helping. I sleep on my back mainly, but when I roll over to my left side, there is more tension/twisting with my leg in the splint and I wake up with painful spasm. I don’t know the reason because I have slept in casts and posterior splints and never had this problem like I’m having with this night splint. Sept. 20th, 2014 – This is the end of the 10th week and it sure was a rough one, but so much better than week 5 when I first started to walk. It also is better at this point compared to my right leg recovery in June as discussed in that blog. I had another ride on my horse today, but this time I didn’t over do it. I’ve backed off of stretching my lower leg today because the more I stretched it yesterday the tighter and hard it got up the back of my calf. I’m focusing more on my lower back position and its relationship to my walking to see if I’m putting more stress on my left leg over my right leg when striding. I’m so flexible and have weak muscles in parts of me and too tight of muscles elsewhere. From this day forward is now the beginning of real rehab for my entire body and not just post surgical healing. I finished this day with a starlit night walk with my husband. I reminisced on how he and I hadn’t walked like this for over 2 years since April 2012 when my extreme burning pain took over my legs all prior to my Sacroiliac Surgery. I came in the house happy to have walked 1/2 mile without any burning pain, lateral knee pain, shin and ankle pain nor low back pain. I continue to research and read to understand the bio-mechanics of how the Gastroc-Soleus-Achilles being too tight can have a negative impact on the foot function/dorsiflexion. I just have a sincere desire to do all I can to heal every detail that pertains to my leg/ankle/foot and my entire body for that matter. Thank you Dr. Gent, Kitsap Foot and Ankle Clinic, along with Dr. Pearce, Champion Sports Medicine, Pinnacle Physical Therapy and my massage therapist, Julie, for going the extra mile to help my rehabilitation in this medical journey. Hang in there with me a little while longer! Patient to Patient Advice: I’ve now had 4 Arthrex Knotless TightRope Stabilizations of my bilateral Proximal and Distal Tibiofibular Joints to end joint instabilities of these joints. I highly recommend this type of surgery as it solves a major problem with no adverse effect at the lateral knees and only a very slight sensory feeling under the skin when you touch it on the medial side of the distal (ankle) where the TightRope is anchored. I wear boots for my riding and I do not feel any pressure at the TightRope sites. A high ankle sprain is something to take serious. In my case the sprain happened in Oct. 2010 but did not fully manifest till my other prior problems were sorted out. What I deal with in rehabilitation is not necessarily what others will deal with as my situation was more chronic than acute with prior bio-mechanical deficits already in place before my ankle sprain. For a severe acute high ankle sprain, I would highly recommend this surgery sooner than later if conservative measures fail. Talking from experience, it could spare you a lot of pain and grief! Great News to share in my Mal-alignment Category showing comparison x-rays and how my body is healing through this journey now posted at this link. Stay tuned for more future blogs or just subscribe to my website for the updates! Comments are always welcome, please email me, see contact page.